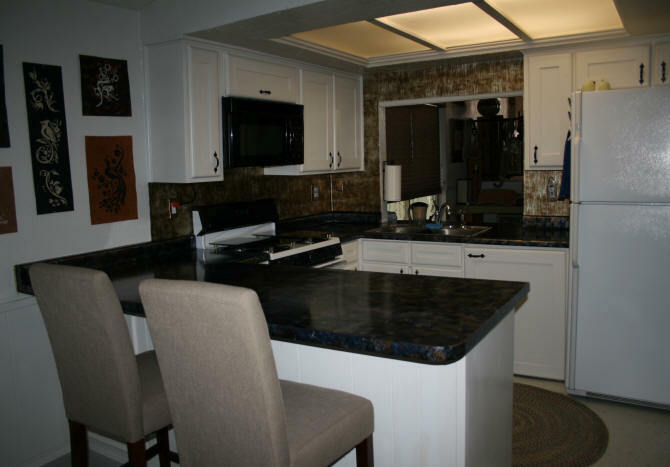 After creating a faux granite counter top in my kitchen (See this here...), I wanted to install some type of backsplash. - along the cabinet moulding and the walls. I am tired of caulking and painting these areas every 3-4 years. The initial problem I had, was determining how much materials I would need. From what point do I take my measurements? On one wall, I needed to decide where to end the backsplash. 1) Do I end the backsplash under the last cabinet? 2) Do I end it above the countertop? 3) Do I end it at the edge of the window? 4) Do I just do the whole wall? Where do I stop the backsplash? Since I was only going for the temporary fix, I went with option one. From there I took my measurements. The other odd feature to this kitchen is the opening by the sink that goes to the dining room area. The wall on the right side is only 2.5" between the opening edge and the moulding on the side of the cabinet. There is also such a small section of wall. I decided to extend the backsplash to cover the entire wall. So whatever backsplash I was going to install, it could not have a design that was wider than 2.5" or it would just look odd being cut off. I then went online to see my options for a backsplash. 1) I wanted something that would go up fast and cheaply. 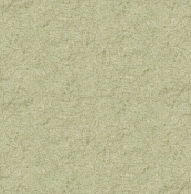 2) I needed something that would camouflage the textured wall underneath. I was not going to take the time and effort to scrape down the texture on these walls. 3) I needed a pattern or style that would look OK in narrow and wider areas of my walls. The price for a 24" x 18" pvc tile is $19.98. According to my measurements, I would need 6 tiles for my kitchen. These tiles are also available at the big box hardware stores and other websites. But they may not have all the styles, colors, and trim that you may need in one location. This particular web site had everything I would need in one spot. Everything meaning, the accessories like the trim and outlet covers that you may need for the color you decide on. The color I decided on was the Bermuda Bronze. It was a little lighter than the other bronzes. Originally I had decided on the Hammered design but I then saw their "Sale" tab. I discovered that the Ripple pattern in Bermuda Bronze was going for $9.98 per tile. At 50% off, this was a deal!!! I also ordered 3 of the 4 foot long J-trim. A 18" corner trim and a package of outlet cover laminate. The total cost for everything including tax was $83.46. Shipping was free on orders over $70. A note about the Bermuda Bronze color. The colors are metallic. 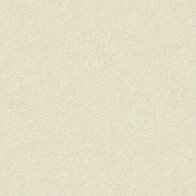 In the image above it looks like a reddish brown and beige. The colors are more of a brown and gold, instead of beige. I received everything via UPS 8 days after I placed my order. Everything was packaged well. Even though the UPS driver threw the one box over my locked gate, nothing was damaged. The first thing that needs to be done is to prepare the surface after you remove your outlet covers and anything else you have attached to the walls. The tiles are supposed to be installed on a clean flat and slightly roughed up surface, if shiny. My surface was not flat because of the painted orange peel texture. I did knock down some high spots and ran some sandpaper over the surface and wiped them down. Kitchen walls prepped for backsplash. Stove pulled out from the wall a few inches. The instructions they provide with the tiles are clear. BUT the instructions are for the installation of the tiles in a 24" x 18" format. Installing the tiles from the left to the right. With this pattern, I had decided to install the tiles in a 18" x 24" format. I wanted the ripple pattern to run vertically, up and down. Not horizontally. Why am I doing this? Dust. For anyone who lives in a desert region.... you know. The dust is a constant battle. I need to dust my walls constantly. If there is the slightest bump on a wall, the moulding on a six panel door, ANY horizontal surface, dust will accumulate on it. So I decided to install the backsplash with the pattern running vertically so I won't have to dust it. To install the tiles with the pattern vertically you should then, theoretically, work right to left. Again I am doing my own thing. I will install left to right. BUT I am doing this slowly with a lot of thought before each cut. I need to make sure each tile has the flattened overlap edge on the right side for the overlap. Not mentioned in the instructions is the protective plastic layer on the tiles. The first tile I worked with did not have it. It was only after I saw a milky look on another tile, that I looked at it closely. I needed to search the internet to see if anyone had come across this. They did. Regarding the tiles I received, 2 did not have the protective layer and 4 did. You will need to remove it. One piece was installed by accident with the plastic on it, which I was able to get off the tile easily enough on the wall. 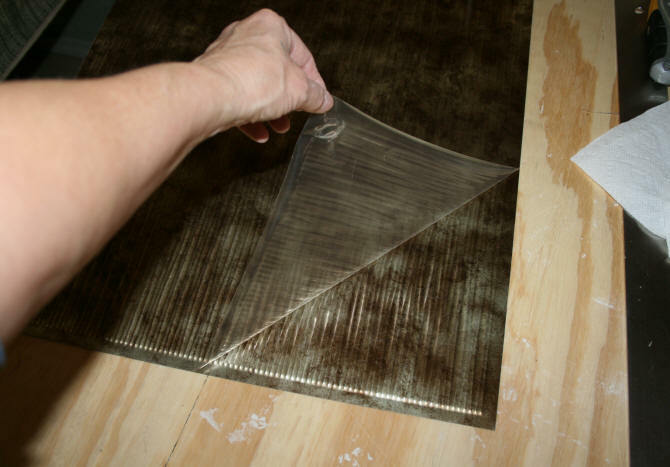 Protective film on some tiles. Note flattened edges used for overlaps. These flattened edge are only along two sides. A long edge and a short edge. Because I was installing the tiles backwards for a vertical installation, this meant my tile pieces had the flat edge on the bottom, instead of the top. So I just cut this portion off when I had to. Why did I install from left to right? I wanted to finish the area behind the stove so I could push the stove back against the wall. The one thing you may need to do, where the backsplash tiles meet your counter top edge, is to paint the wall along the edge a darker color. I noticed a few areas where you could see a bit of the white wall peeking through. If I had known this would happen when I painted my counter top, I would have moved the masking tape up a little on the wall and allowed the counter top paint on the edge of the wall. So if you are doing a countertop and backsplash facelift combo, remember to do this. What I ended up doing was touching up these areas with a tiny artist paint brush using the onyx black black from my countertop kit. Also, you may decide to use the j-trim or edge moulding along the edge of the counter top. I did not do this because of the dust issue. If you use the j-trim, it should hide the wall completely. 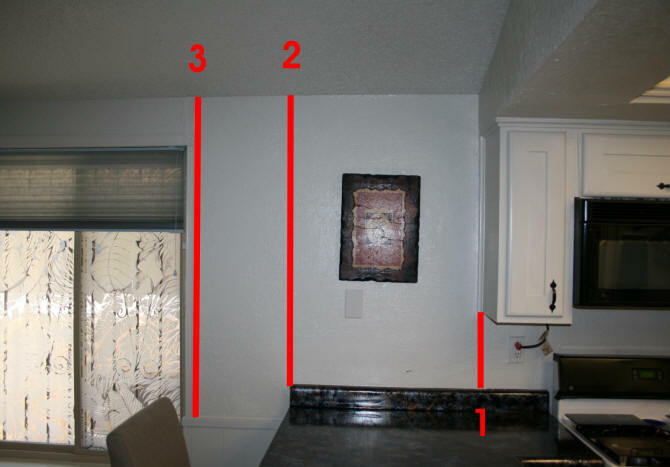 In the photo above, I did use the j-trim on the far left side against the wall and along the top edge below the microwave. 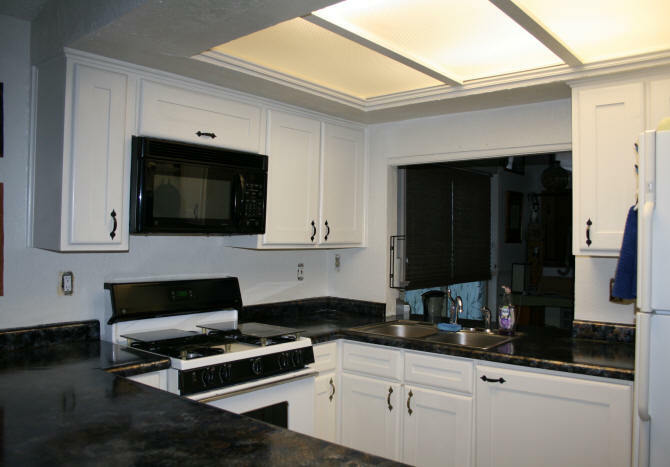 In retrospect, I should have used the j-trim along every edge where the backsplash met the ceiling and the edges of all the cabinets. If you want cleaner looking edges all over, do this. The 4 foot trim piece is only $2.15. When ordering, add a couple more on your order than you originally planned for. You will probably discover later, during installation, an area where you could have used it. Backsplash installed on the rest of the walls. 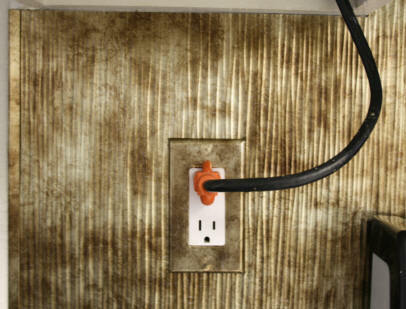 Outlet covers covered with laminate. 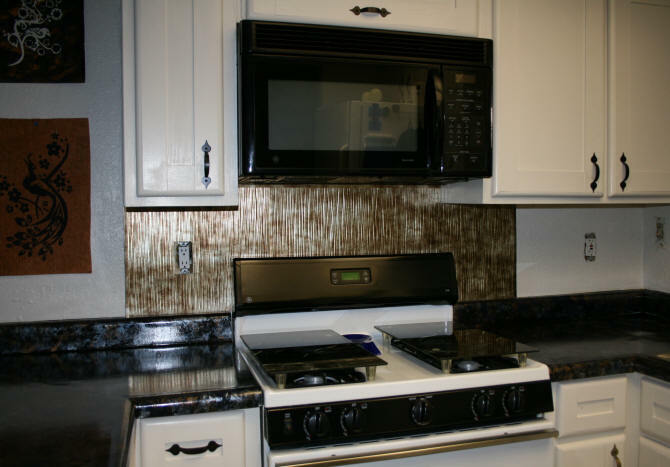 The above picture shows the backsplash on all of the wall areas. I did have a little of the tiles left over. I was lucky and made no major mistakes. I used just one tube of the Locktite adhesive they recommend. There is enough of the outlet plate laminate to cover 6 standard size outlet covers. If you have the wider outlet covers, it will only cover 4. With some small scraps I had, I covered the outlet cover screws. You can barely notice this from a distance. Another alternative to covering the screws, is to dab them with some brown paint if the screws are white. If the scraps fall off, I will do this. One area still needs a little work around the top of the opening by the sink. I used the J-trim on the right and left side of the opening, but did not have enough for the top. There is also one more issue here regarding the moulding at the top that is attached underneath the opening. If you look closely at the photo below, you will see the left side is lower. Yes, I could tear out the moulding and replace it. But this is too much work for a kitchen that I eventually want to tear apart. Also, I always find other problems underneath anything I remove in this house. Easier at this time to just cover it. AND do this with only the existing moulding scraps in my garage. Added piece of trim painted metallic hammered brown, which is over bottom edge of backsplash and even with the moulding under opening. Added thin piece of polystyrene moulding along top edge of backsplash and ceiling. The photo above shows what I did. I had a piece of 2" pvc trim that I had routed out a lip on. I had routed it out for something else, but decided not to use it at the time. Now I had a use for it. I had some Hammered Brown spray paint from another project and painted it after cutting it to size. 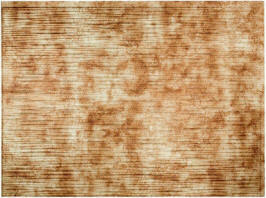 The brown trim is 46-5/8" long. 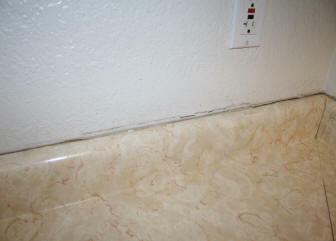 The lip of the trim went over the bottom edge of the backsplash. The thicker part of the trim was nailed right into the moulding. I leveled it out so you could only see about a 1/4" of the white moulding. On the opposite side of opening, you cannot see the brown trim unless you look under it. Along the top edge of the backsplash above the opening I placed a thin piece of polystyrene shoe moulding. I first painted the moulding the kitchen white color, glued it on with some clear caulk, caulked the seam between the polystyrene and ceiling, and then painted the ceiling seam. I used clear caulk on the seam between the polystyrene and the backsplash. Now this section of the backsplashed wall, looks a little more square. Of note about the color of the backsplash. The photo with the added brown trim is closer to how the color is in person. The brown is a medium brown and the beige is actually gold. I could have placed the brown trim all around the opening and got rid of the j-trim on the sides. But remember my criteria. I needed to use a scrap I already had in my garage. I did not have enough to go all the way around. The next thing I worked on was the artwork on the wall where I decided not to put the backsplash.